Total TA distance covered: 2003 km!!! The big 2000!! 2/3 of the way there. 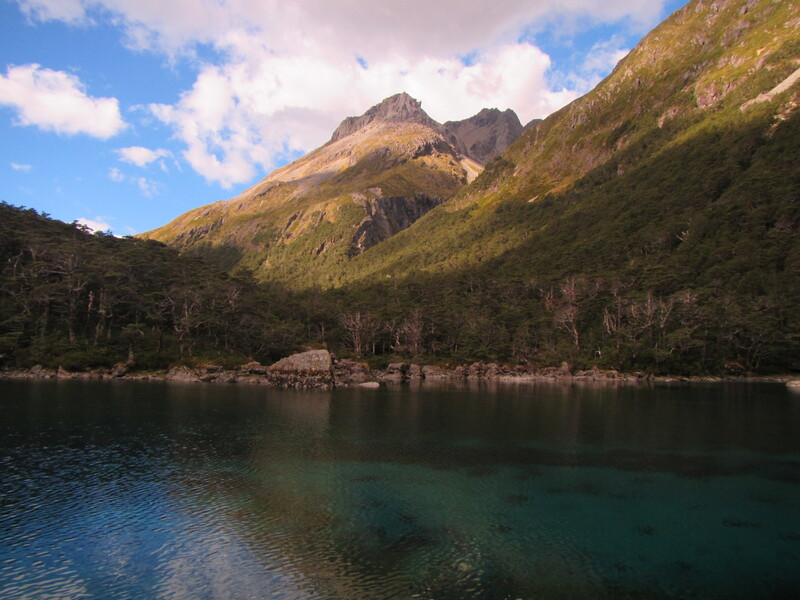 Leisurely start from Blue Lake Hut. I was treated like a rock star last night for what ever reason. The hut was full of section hikers and day trippers and they had never me anyone attempting to complete the full Te Araroa. Really? There are so many off us this year. Anyway, I lapped it up. I don’t mind being the centre of attention but so many questions that I’ve been asked a thousand times already. What do you eat? How many kilometres do you walk each day? What brand is your tent? Etc…. Thats all good though. I’m happy to answer the same stuff over. The more people we can collectively get to dream big and make things happen the better I reckon. One perk of being the big Te Araroa walker in amongst people only out for a few days is the lavish array of food given to you and my luck this morning, half 2/3rd of a bottle of red wine in a plastic bottle – to celebrate my reaching 2000km today and the 2/3rd point on the trail. No arguments from me. I was looking forward to it later today. It was a quick climb up to Lake Constance with views back down towards Blue Lake. 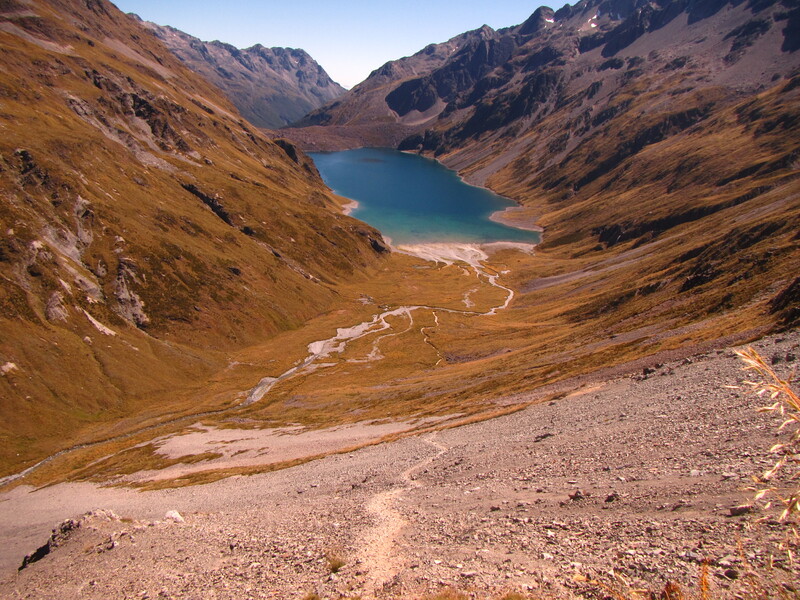 But then it took longer than expected to get around the lake and up towards the head of the valley for the long climb to the Waiau Pass. Getting to the end of the lake I could fully appreciate the climb up the scree slope to the pass for the first time. It just seemed to go up and up and up. It was going to be a long, slow climb and I had a short break before the ascent. Then it was time. I had to get on the scree and start making my way up. I wasnt going to get there sitting on my arse looking up at the thing. With one slow step in front of the other I started the climb. Initially on larger rocks that had accumulated at the bottom of the slope, having tumbled down at some point in the past. But then the trail moved just off to the side of the main scree slope which was a relief. Although there was definitely a section higher up that crossed across it as you could see the defined foot pad from previous walkers from below. Slow and steady. Up and up. One foot in front of the other. Walking poles shortened to act more like ice axes, planting into the higher ground above and using them to leverage my body weight up slope. Around half way I saw two people descending. We met and talked briefly. From France, the couple are walking Te Araroa NOBO and it’s taken them 6 weeks to get to this point. Thats encouraging for me. I’m a bit concerned about the time it will take to complete this adventure, wanting at least a 2 week transition back to normality before heading back to work, rather than finishing and going straight into the thick of ordinary life again. We parted and I continued, up onto the scree itself. Lots of tiny loose gravel. At some points it was a case of one step forward, two steps back. Taking my time I minimised the my slips and reached the top of the scree ok. The route then continued over some more solid ground and across larger rocks. Moving up and onto the final scree slope to the top of the pass I meet a Kiwi section tramper coming down. Pleasantries exchanged we moved on and I spied the top, marked by a large cairn. On reaching it, I let out a holler before realising there were people coming my way from the other side. A group of school leavers having just finished year 12 and out to enjoy the final weeks before uni. 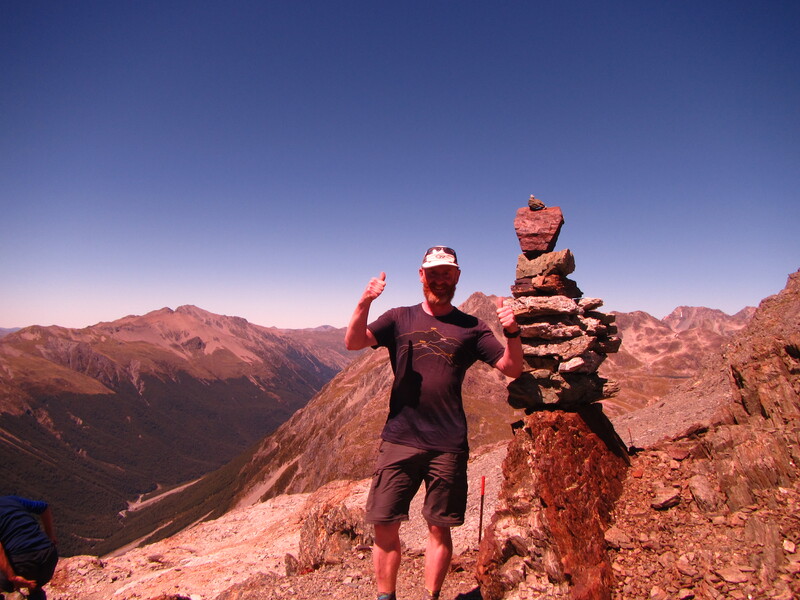 They thought my trip was awesome as well and were surprised I didnt cheer harder on reaching the top of the Waiau Pass. They also had a thousand questions and we shared morning tea as I answered them as best I could. I was also shouted to chocolate, thank you very much guys. Heading down was fine to start with, over rocky but solid ground. An up coming section is talked about quite a lot in the track notes, on blogs etc… as the hardest section in Te Araroa. More of a rock climb than walking I was lead to believe. The build up was palpable as I’d heard so much about it and I was looking forward to see what the trail could throw at me. On reaching the top of a steeper section I wasnt quite sure if this was the spot or not. It looked steep and there would be short sections to down climb using all four limbs but was it didn’t look too bad at all, at least not in comparison to similar sections I’ve walked through in SW Tas. Perhaps there was another spot further on that was the really hard stuff. 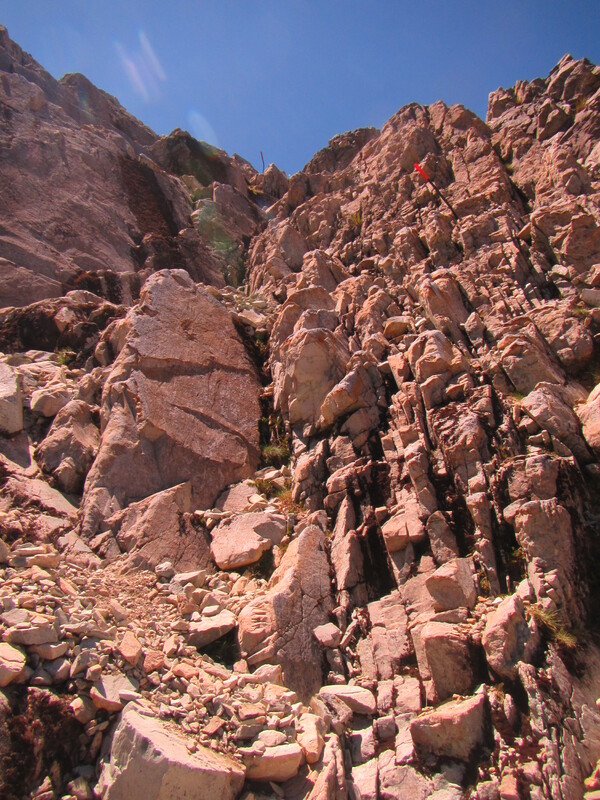 I got down in no time with little hassle and it was only when looking back up that I recognised that this was in deed the hard section, I’d seen countless images looking up the face on other blogs where some had described their descent as terrifying. I have no wish to big note myself or sat it was really easy but this section doesnt deserve the attention, or being singled out, in the track notes. There have been countless more dodgy sections on the trail. I think if the terrain is steep, trampers are going to take their time to get down safely anyway and the reputation built up around this single feature is not justified. The knee jerking descent all the way to the bottom, some 600 m is more of a danger. Slowly but surely I made my way down to the bottom and the twin rivers junction. I found a nice spot to prop for lunch by the river and enjoyed the new views looking up into new valleys. It was while sitting quietly eating lunch and just observing my surrounds that I had intense feeling of happiness overcame me. Sitting outside, surrounded by towering mountains, winter snow still trapped in narrow south facing chutes; sitting next to a mountain river, the sun out and shinning brightly. It was perfect. It will be hard to go back to work after this trip and settle back into the ordinary. If anyone knows the answer to how I can sustain this current lifestyle please share it with me. Following the Waiau River down stream I passed a series of water falls. Long tendrils of foaming white water, cascading down between boulders to bright clear blue plunge pools below. I saw the perfect waterfall shower spot but unfortunately it was too difficult to reach. I’m determined to have at least one wash under a waterfall on this trip. The trail moved from the open valley with alpine scrub and grasses back into the tree line and continued to follow the river. There were a series of avalanche debris areas that had to be crossed which I found frustrating. Adding the distances up thete would have been more than a kilometre of the stuff to walk across. I find them incredibly difficult as the foot placements constantly shift and threaten to twist ankles. It’s easier to rock hop or walk on top of the larger boulders that aren’t likely to shift but that is not always possible, and sometimes they do shift. Slow and steady again to avoid injury. Finally, trough the last debris field the trail turned into something more resembling a trail and made for quicker walking. Moving down the valley, never far from the rivers edge and occasionally in the river where sections of trail had been washed away, the valley broadened as I approached Caroline Bivvy, to reveal larger grassland areas. There wasn’t much to Caroline Bivvy, a two person emergency shelter, no windows and collapsing bunks. And the sandflies were horrific. I pressed on for another 3 kilometres and found a sheltered spot in amongst old gnarled beech trees, over looking the river from a high bank. Perfect that would do me for the night. Oh yeah, just after Caroline Biv I passed 2000 kilometres. Wow!!! I was a rush to get the tent up and all my gear inside as the sandflies were the thickest I’ve seen to date. Swarms of the little buggers. I hate the fact that something so small can so easily ruin paradise. congrats on reaching 2K mick. u must be sooooooooo fit by now that the”hard sections” are just a walk in the park. We apologize on behalf of NZ for the sandflies – you need some tropical strength repelant. They are awful. Ha ha… Thanks. Think I’m through the worse of they. I hear they thin out further south.